Choosing 'On Completion' from the Billing Type when creating a proposal, allows you to choose when and how much you want to bill for a particular service. Used by itself, you can then invoice once, after you have completed the work. If you enable 'Deposit' you can also split this payment into 2 payments, one upfront and one on completion. How Does Bill on Completion Work? When adding a service to a proposal, select On Completion from the Billing Type drop down menu, then click the Save Service button and continue adding more services as necessary. If you wish to split this into 2 payments - Upfront and On Completion, turn on the 'Include Deposit' toggle and select what percentage of the total, you want to be due on acceptance. Once the proposal has been saved, you will see it split into two lines, one part in On Acceptance, one in On Completion. Note: We do not show the percentage, because the 'On Completion' part of the payment is still editable and after acceptance you can still change this amount. On the Client Acceptance page, your client will see the same layout. Clicking Invoice client now will bring out a slider from the right hand side with options for billing on completion. If you have multiple items to be billed on completion they will show up as separate items. You can tick the services you want to bill each time, and also edit the amount to be invoiced. When you have made all the necessary adjustments, click Invoice Client. 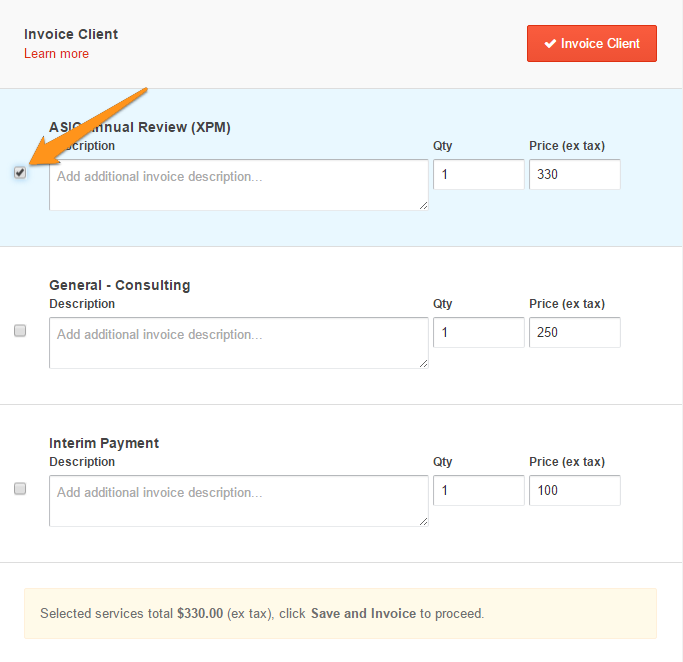 This will take you back to the proposal summary page, and you will see the invoice created within the invoice entry. If you click through to the invoice in Xero or QuickBooks Online, you will see the invoice that has been generated by Practice Ignition. If you have payments enabled, creating an invoice via bill on competition will automatically create an 'awaiting payment' invoice using your default terms for the due date. Eg. if your default invoice terms are set to immediately the bill on completion invoice will be raised and payment process will be triggered that day.